It feels good to be validated by third party surveys. Last 14 years we have been working in this business to create value based medical coaching for PG aspirants in India. 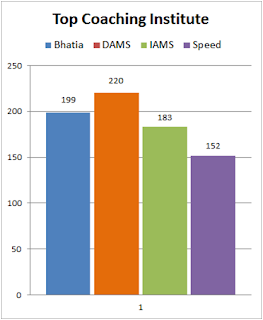 Our team at DAMS PvtLtd has been tirelessly working towards this and we have delivered results year after year. We have delivered AIIMS topper for last 4 years now in continuity and 24/top 50 were DAMSONIANS last year. Here are some excerpts from the survey with the weblinks. Prominent medblogger has recognised DAMS as the top most institute in this business through his survey with medical students. We thank all involved and promise to work harder in years to come. AcrossPG Team has conducted the survey for selecting The Best Medical PG Coaching Institute in Dec ’12-Jan 2013 ( Top Medical PG Coaching Institute - Survey Results). Here are the highlights of the survey. 400 medicos participated in survey, from various medical colleges of all states, ranging from batches 2000 to 2006. 7 PG Coaching Institutes from across the country including Bhatia, DAMS, IAMS, Speed PG Institute, MIMS Calicut, MEDPGTHRISSUR and others. Many students were in favour that rigorous self-study is important if NEET happens, and coaching is useful only with self-study. We have calculated the results by counting votes from only unique IPs to remove bias from multiple votes casting. An effective score is calculated institute-wise from the total votes submitted. This is to remove any bias occurred due to difference in number of votes for each institute. The effective scores are then compared under 4 broad categories – Faculty, Study Material, Tests and Effectiveness for NEET PG. Delhi Academy of Medical Sciences occupied the top position. Get more details from <a title=" Top Medical Coaching Institutes in Chandigarh"href=" http://blog.oureducation.in/top-coaching-centers-for-medical-entrance-exam-in-chandigarh/”> Top Medical Coaching Institutes in Chandigarh</a>, this will help you to select the best one for you.